Dorothy Lorraine Meyer, 87, of Sidney, Neb., passed away Tuesday morning, Jan. 17, 2017, at her daughter’s home east of Sidney. 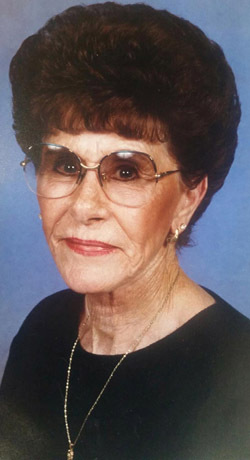 Cremation has taken place, and inurnment will be held at a later date in Fort Collins, Colo.
Dorothy was born March 20, 1929, in Lingle, Wyo., the daughter of Henry and Mary (Whitman) Hartung. The family moved to the Fort Collins area, where her father farmed, and this is where Dorothy received her education. After high school, she worked for Safeway, where she met her future husband, Henry “Hank” Meyer, and the two were married June 27, 1948. To this union, three daughters were born: Sharon, Gwen and Judy. In 1950, the family moved to Sidney, where Hank was employed by Marathon Oil. Dorothy had recently moved in with her daughter, Gwen, due to failing health. She was an avid Farkle player. Survivors include daughters Gwen Stone of Sidney and Judy Shaw of Rio Rancho; brothers Bob Hartung and wife Jackie of Fort Collins, Don Hartung of Casper, Wyo., and Melvin Hartung of Johnstown, Colo.; sisters Alberta Solomon and Frances Leeper, both of Fort Collins, Norma Stavran of Grand Junction, Colo., and Loretta McGinley of Arvada, Colo.; five grandchildren; and seven great-grandchildren. She was preceded in death by her parents; her husband; daughter Sharon Hickey; sister Edna Hartung; and brother Clarence Hartung. Arrangements are under the direction of Holechek Funeral Home and Cremations of Sidney. Condolences may be expressed online at www.holechekfuneralhomes.com.